Geraldine B. 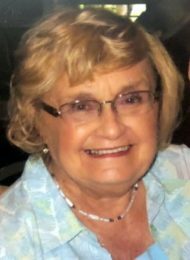 “Geri” Durchak, 86, of Millersville, passed away Friday, January 25, 2019, at the Hamilton Arms Center, Lancaster. Born in Bridgeport, CT, she was the daughter of the late Walter and Anna (Kazimir) Sadusky. Geri was the beloved wife of L. Michael Durchak, and she was truly the love of his life. Having first met in the 3rd grade, they started dating in high school, married in February, 1954 and shared 64 years of marriage. Geri graduated from St. Cyril Commercial High School in Bridgeport, CT and for many years worked as an Administrative Assistant at the Housatonic Community College. She was a former member of St. Philip the Apostle Catholic Church, Lancaster. In addition to her husband, Geri is survived by her daughter, Susan Todd and her husband Jim of Lancaster, and her son, James Durchak and his wife Amy Pelchat of Derry, NH. Also surviving are four grandchildren, Jaime Durchak Colon and her husband Jason, James Hultquist-Todd and his wife Taylor, Nicole Durchak Potts and her husband Ian, and William Todd; and three great-grandchildren, Sophia and Sadie Potts and James Colon.